The ISU-152 was an absolute nightmare for the Wehrmacht. Much like the SU-152, it was capable of blowing Tiger, Ferdinand, and Panther turrets/casemates open. However, what made the ISU-152 inherently better than the SU-152 was its superior armor and towing power. It had three major roles – assault gun, tank destroyer and mobile artillery, which made it one of the most versatile heavy vehicles of the war. After the war, it remained in service well until the 1970s, and some even saw some unconventional action at the Chernobyl liquidation, 1986. 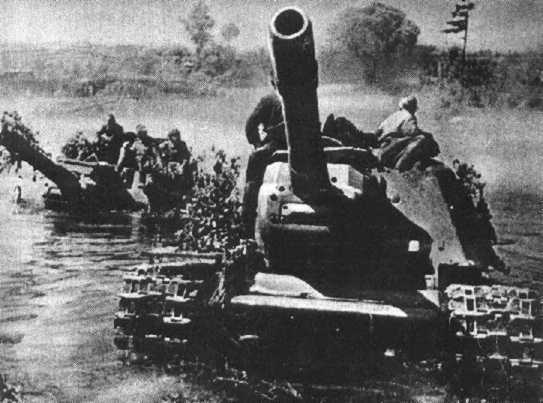 A very dramatic photo of a pair of ISU-152s fording a river. The ISU-152 came about for two main reasons – the success of the SU-152, and the arrival of the IS heavy tank hull. Seeing as though the IS was an upgrade of the KV series, which the SU-152 was based on, it made perfect sense to mount the same weapons on the newer platform. This would mean that maintenance would be easier, with a sort-of standardization of late war tanks. Shortly after the SU-152’s deployment, the NKTP (Ministry of Transport Machine-Building Industry) ordered design teams in Chelyabinsk, in cooperation with the Mechanized Artillery Bureau, and General F. Petrov, to design two new heavy assault guns based on the IS-2 hull on May 25th, 1943. The development for this tank was undertaken by the famous Joseph Kotin, and G.N. Moskvin as the main designer – the first prototype was ready in only a month. The first prototype, known as the IS-152, was similar to the SU-152, except for a higher superstructure that was more rectangular, and also featured less sloped side armor. Thicker frontal and side armor (90 mm instead of 60 mm) did not make the crew compartment any smaller, so there was still space for 20 shells for the ML-20S gun. The other main differences between the SU-152 and the IS-152 were that the suspension was lower, and a heavy, two-piece gun mantlet was bolted onto the right of the hull. It underwent factory trials in September, 1943, but a large number of problems with the design was encountered, so the design was reworked. Finally, the second vehicle, designated the Object 241, was ready in October, and it began factory trials, shortly followed by state trials at Gorohovestskom test range. By November 6th, 1943, an order was issued for this tank to be mass produced and it was now known as the ISU-152. Production started in December and replaced production of the SU-152 at the Chelyabinsk Kirovsk Plant. The ISU-152 was hardly a different concept to other Soviet self-propelled guns. It still featured two compartments – the fighting compartment and ammo storage in the front, and engine and transmission at the back. The gun was mounted slightly off-center and could traverse 12 degrees left and right. It had 12 torsion bars, 6 road wheels, rear drive sprockets, and front idlers identical to road wheels, thus making maintenance easier. There were three internal fuel tanks – one in the rear compartment, and two in the fighting compartment. Like most late-war Soviet tanks, there were also up to four external fuel tanks that were not connected to the engine. The crew of an ISU-152 appear to be cleaning their boots with Nazi banners. All roof hatches were fitted with periscopes, as well as there being two gun sights – a telescopic, and a panoramic ST-10. An intercom was also fitted, and each vehicle had a standard 10R or 10RK radio set. The crew was also given a pair of PPSh-41 sub-machine guns with up to 1491 rounds, as well as 20 F-1 grenades in case they needed to abandon the vehicle in combat. Giving the crew weapons was not at all an uncommon practice. 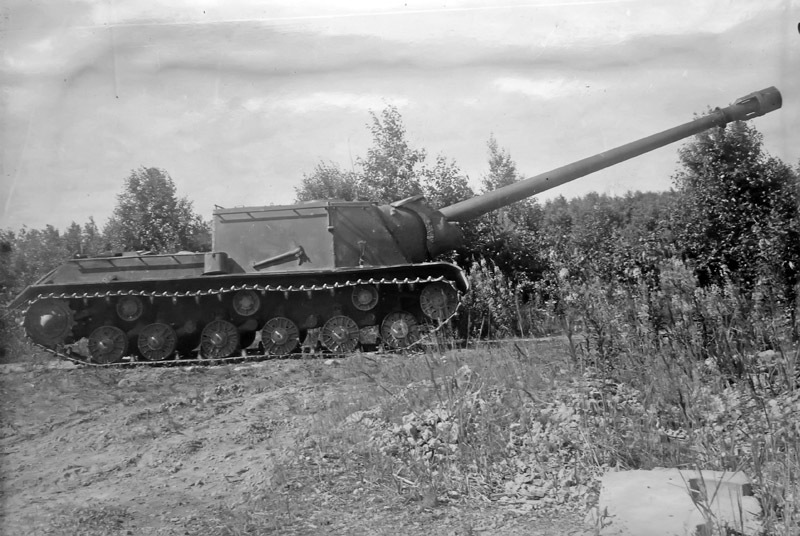 Whilst at first, the ISU was based on the IS-1 hull, it was later based on the IS-2 hull in 1944, which meant that the vehicle had extra fuel capacity, a newer radio, a slightly modernized main gun, mantlet armor was increased, and finally, an AA machine gun was installed in an AA mount. Also, a fourth, round hatch was fitted at the top right of the roof, next to the rectangular hatch on the left-hand side. The later ISU-152 modifications, with newer gun and slightly longer barrel, (4.9 meters), had a maximum range of fire of up to 13,000 meters. Between December 1943 and May 1945, 1885 ISU-152s were made. When production finally ended in 1947, 3242 vehicles had been produced, although some sources give wildly varying figures for total production. An ISU-152 at Yad la-Shiryon museum, Israel. On the right is a BTT-1 recovery vehicle which was converted from the ISU chassis, after having its main gun removed. 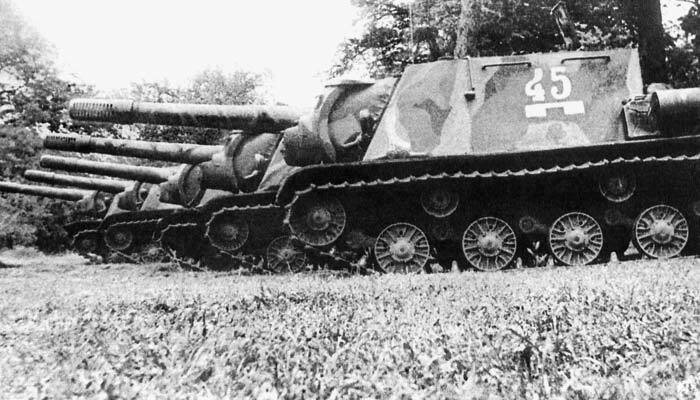 One prototype was developed using ideas from the IS-2 and IS-3 in 1945. 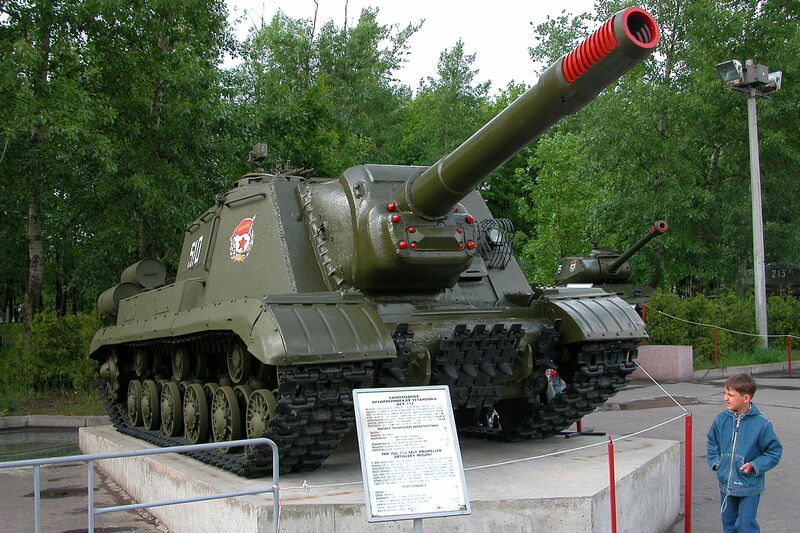 It was fitted with a modernized ML-20SM mod.1944 gun-howitzer, which was 4.5 m long. Muzzle velocity firing the 48.78 kg HE shells was 655 m/s and the tank could fire 1-2 rounds per minute. It featured four hatches, as well as one emergency hatch below the driver’s seat. It also had two 12.7 x 108mm DShK machine guns, one as coaxial and one in an AA mount. 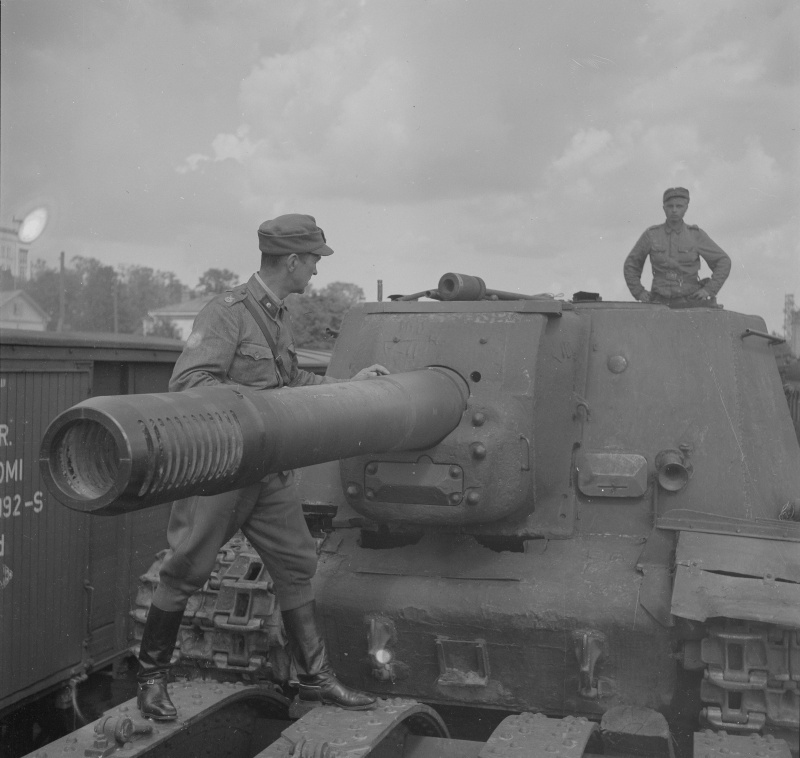 Armour thickness at the front of the gun was 320 mm (12.6 in) thick, combining the hull with the mantlet, making it one of the best protected vehicles of the era. However, the extreme armor angle and the increased gun recoil meant that the crew had substantially worse working conditions and for this reason, it was never adopted. Object 704 at the Kubinka museum. This was a modernized variant from 1956, undertaken at the Leningrad Kirov Plant and designated the Object 241K. It took a new engine, the same as the T-54 and the main, internal fuel tank now had a capacity of 920 L, giving it 500 km more operational range. It had ammo capacity for another 10 shells, now giving it a grand total of 30 shells, due to an additional fuel tank in the crew compartment being removed. The commander’s cupola and sights were reworked and improved. It was also given a new running gear design based on the T-10 heavy tank. The mantlet was given an additional armor ring – some even had 15 mm extra welded onto the 60 mm mantlet from above. This was the last modernization that the ISU would face and it was undertaken in 1959 at the Chelyabinsk Kirvosk Plant, ‘the birthplace of the ISU’. It was much the same as the IS-2M modernization at this time, and the upgraded vehicles were designated the Object 241M. It featured all the same upgrades as the ISU-152K, except they were given night vision sights, more ammunition for the new DShKM machine guns, but they were not given a new cooling system for the new engine. 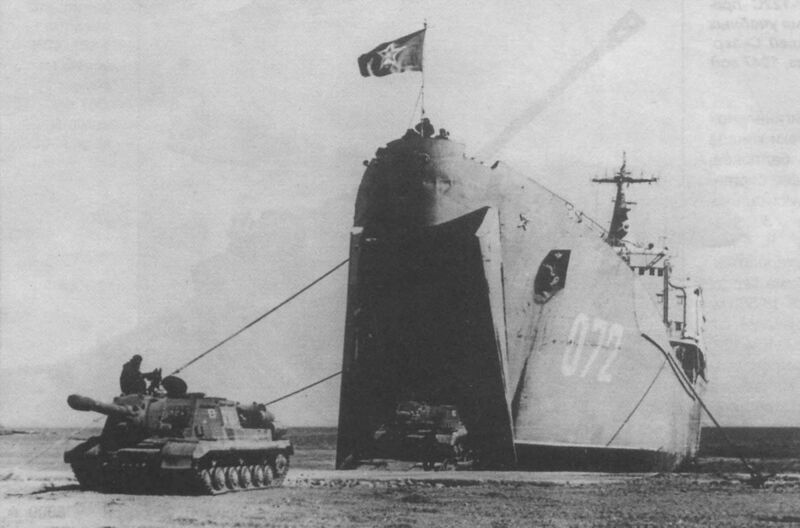 A pair of ISU-152Ms are landed from “Voronezhskiy Komsomolets”, a Tapir Class Landing Ship (NATO Reporting Name: Alligator), some time in the late 1960s. In August 1944, there was a need to create a tank that could directly and easily knock out the heaviest German tanks, such as the Jagdtiger and King Tiger. This led to the attempt to build a longer barreled 122 mm gun on the IS-2 and ISU-122, as well as a longer barreled 152 mm gun on the ISU-152. The first, the Object 246 (ISU-152-1), featured the BL-8 gun. It had a maximum range of 18,500 m with a muzzle velocity of 880 m/s with its 43.56 kg HE shell. The gun itself was eight meters long! During testing, it was discovered that it could penetrate 203 mm of armor at 90 degrees from up to 2000 m away. However, whilst this sounds excellent, trials in December 1944 showed that the crew found operating the gun difficult, the muzzle brake and breech block were unreliable, the barrel strength and angle of horizontal guidance were unsatisfactory, and finally, the very long gun would limit the maneuverability of the vehicle, much like the D-25 on the ISU-122 limited its maneuverability. A second prototype was reportedly made in August 1944, the Object 247 (ISU-152-2). It fitted the improved BL-10 gun, which had a maximum range of 18,500 m firing a 43.56 kg HE shell, featuring a muzzle velocity of 850 m/s with 3 rounds per minute. During testing, it was discovered that it could penetrate 203 mm of armor at 90 degrees from up to 2000 m away, but the barrel integrity and angle of horizontal guidance were poor. Another attempt at improving the gun was made, but the war ended before anything more than a test revealing that the new gun had a maximum range of 19,500 m and a muzzle velocity of 880 m/s. It was then deemed that there was no need for this work to continue, mostly because the war was over, and there was no need to combat heavily armored German vehicles. Two similar projects were also made based on the ISU-122 chassis. An ISU-152-1 with the BL-8 gun. Most ISU-152 were often fielded in mixed units with the ISU-122, despite attempts by Red Army Commanders to segregate the two vehicles. There were two main reasons for this – the first being that two sets of calculations would be needed for indirect fire orders, and the second being that the tanks took different ammunition types, which would cause supply problems, as two sets of ammunition would need transporting. The biggest let down for the ISU-152 was its ammunition capacity. It only had space for 20 shells, usually 13 HE and 7 AP or Concrete-Piercing, and possibly some stowed on the rear deck. It took up to 40 minutes to resupply ammunition and it needed a very strong loader, as each shell weighed over 40 kg. This would strongly affect combat capabilities, especially if supply lines were bogged down, or if an offensive lasted too long, meaning that the tank would run out of munitions far too quickly. Having said this, an experienced crew would make the best use of its limited ammunition and it would fare well. Whilst not designed for this role, it inherited the name “Zveroboy” (Beast killer) from the SU-152, because it could knock out the Panther, Tiger, and King Tiger tanks, as well as the Jagdtiger, and Ferdinand/Elefant. It is actually well known for this role because the Soviets were able to make this into a very effective propaganda tool in the late war. 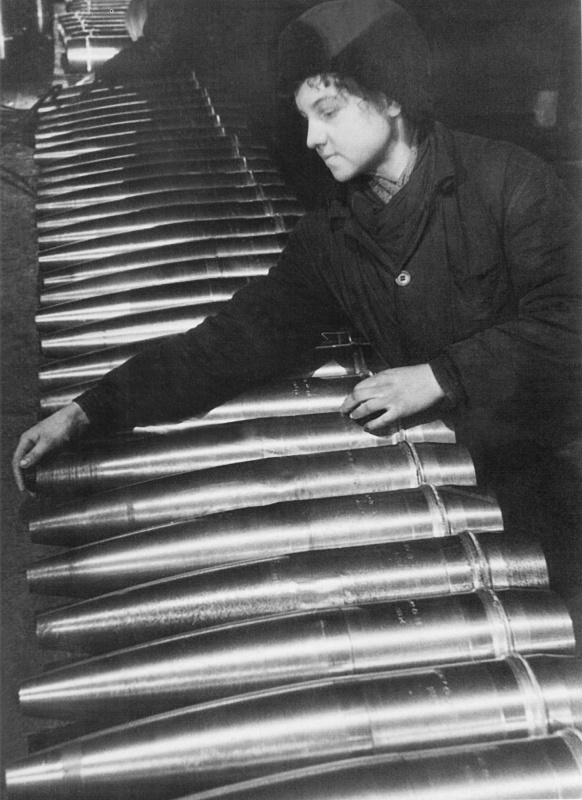 Whilst the weight of the shells (and therefore slow loading) resulted in 1-3 rounds per minute, the sheer mechanical shock was enough to kill the crew of an enemy tank, or disable an enemy tank even without an armor penetration, which is useful because generally, these shells did not penetrate. 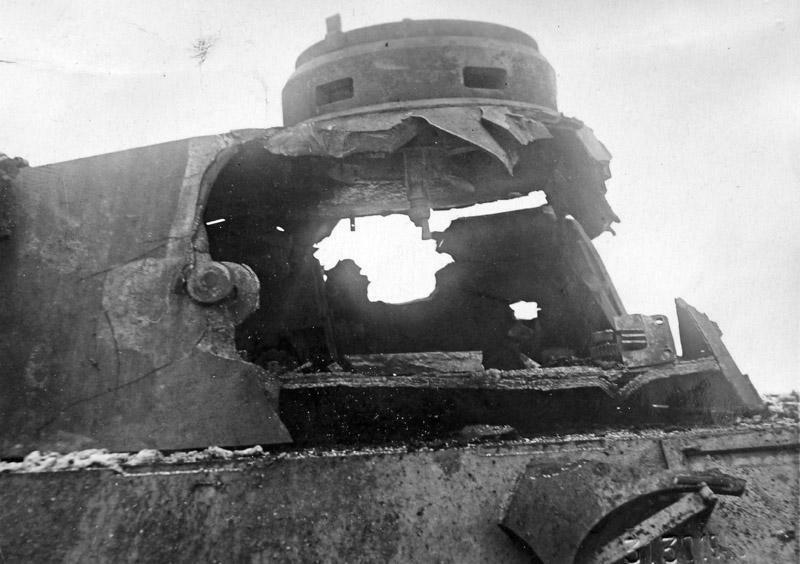 It has even been reported that the shell could totally blow the turret off of a Tiger tank! At Kursk, AP shells were given to the ISU-152, but these rounds were expensive, hard to make, and were in very short supply, as well as only being a little more effective than the HE round. Finally, when fired upon, the ISU-152’s 90mm, 90 degree sloped armor fared well against 75 mm German guns at long ranges, but the Tiger’s 88mm gun was always a killer. However, despite stories and amazing photos of the ISU-152’s exploits as a tank destroyer, at close ranges, it was vulnerable to German high caliber guns, and it had a low rate of fire. Not only this, but it was inaccurate, and not intended for the role. ISU-152s tended to be used for direct fire as an assault gun, which saw it fighting against enemy positions, not necessarily enemy tanks. The result of an ISU-152 shell hitting a Panther’s turret. Instead of being knocked off, the turret was blown wide open! 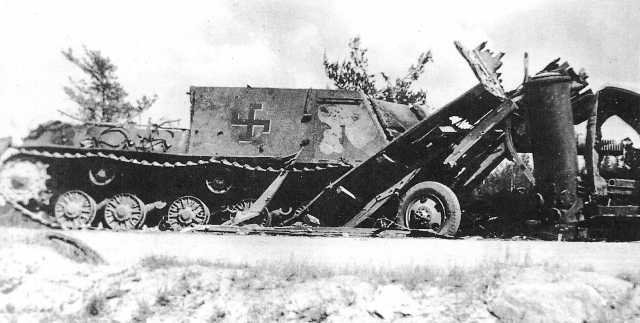 This Brummbar was reportedly hit by an ISU-152. When field guns were in short supply, the ISU-152 was able to perform preparatory shelling to help out with Red Army advances. The Soviets never had any specialized, mass-produced vehicle for this purpose, but the ISU-152 was as close as they would get for the time being. Whilst towed artillery units were given to mechanized divisions, they were vulnerable and slow to field compared to the ISU-152. However, it must be remembered that in heavy SPG regiments, the tactics used for the ISU tanks were not indirect fire, but direct fire, making this role a rarity. Assault gun was the main role taken on by the ISU-152. 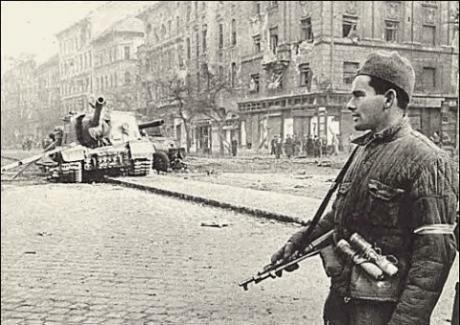 It was described as one of the most valuable weapons in urban areas like Budapest, Berlin, and Konigsberg. Its armor was, as mentioned, surprisingly excellent defense against German AT guns. 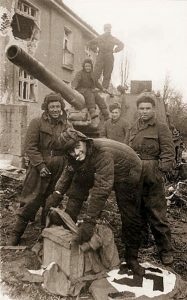 The massive HE shells were perfect for taking out enemy fortified positions and buildings. Considering that using the conventional, towed ML-20 field gun would result in its crew being exposed, mounting the same gun in a tank negated that problem, and proved to have fantastic results. When supporting other tanks, the ISU-152 was always placed behind an IS, about 100-200 m behind, and it was usually second in the column. 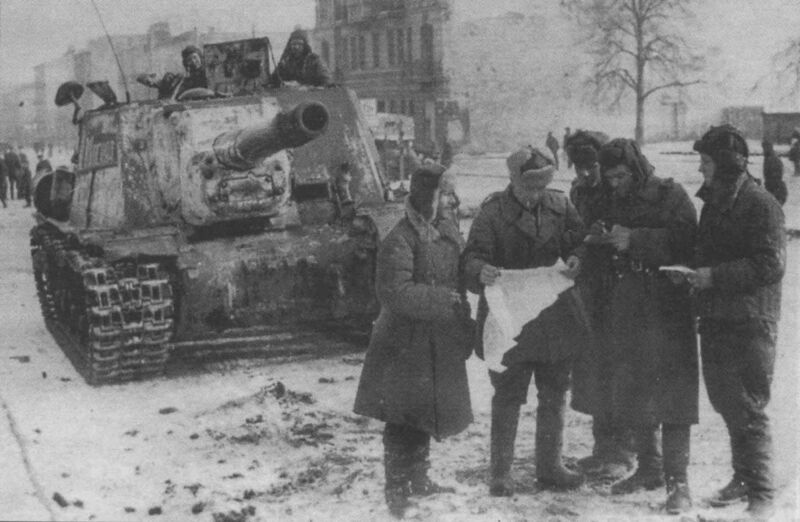 The commander of an ISU-152 and other officers consult a map during WWII. Regiments using the ISU were formed as Independent Heavy Self-propelled Artillery Regiments, and between May 1943, and 1945, 53 of these regiments existed. 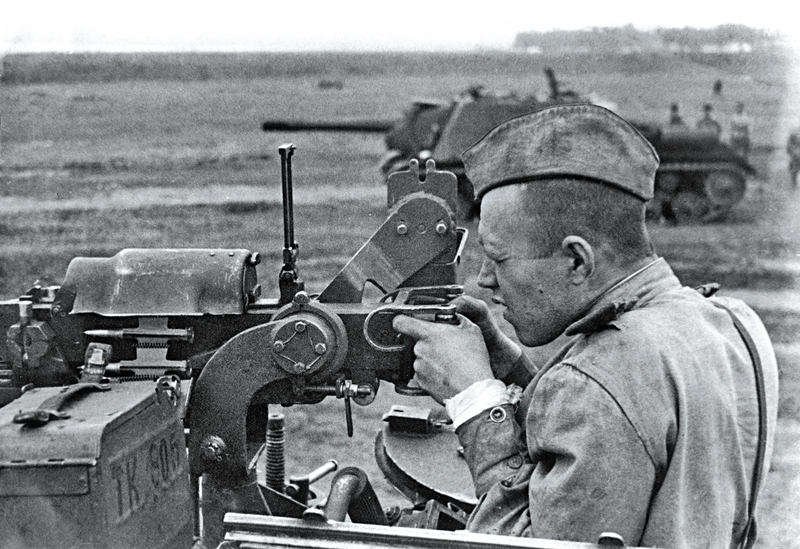 In December 1944, Guards Heavy Self-propelled Artillery Brigades were formed which gave heavy fire support to tank armies, and fielded 65 ISU-152s or ISU-122s (sometimes combined, although, as mentioned, there were attempts to segregate the vehicle types). Many were reformed regiments, and used similar tactics to what they were used to, such as supporting infantry through direct fire. These regiments fielded trucks, jeeps, and motorcycles for support. The biggest risk to the ISU-152 was posed by Panzerfaust-equipped infantry in urban combat. To combat this, they operated sometimes in pairs of tanks, but always with infantry, much like many tanks did in urban combat. The supporting infantry always had a specialized sniper (or marksman), sub-machine gunners, and sometimes a flamethrower. The heavy DShK machine gun on the ISU-152 was also excellent for killing Panzerfaust-wielding soldiers in upper floors or behind cover, as it had excellent stopping power. 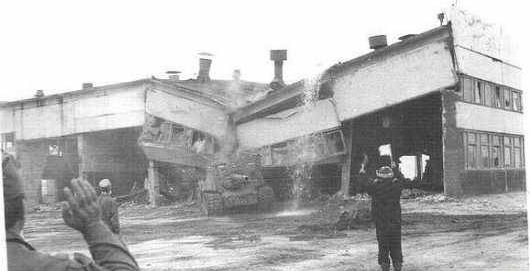 However, if these tactics were not strongly understood, the ISU’s less-well armored roof was vulnerable and this would be exploited by the enemy. 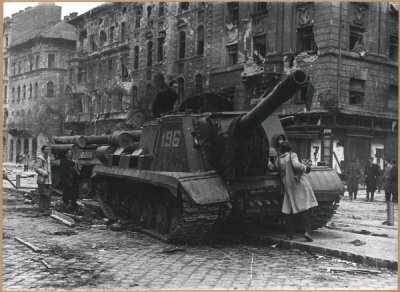 The ISU-152 would later be used in many maneuvers across the Eastern Bloc, and a small number were later sent to Hungary in 1956 to end the uprising. These were often knocked out due to the brutal street fighting and use of Molotov cocktails by Hungarian Partisans. It is known that a very small number of ISU-152s took part in the liquidation of the Chernobyl disaster, 1986. They were used to clear buildings by ramming them down, like a bulldozer. After they became too irradiated for use, many were either dumped in vehicle graveyards, or were just left where they were. In 1944, two vehicles were captured. One was lost in fighting, the other never saw combat. In 1944, 30 were given to the People’s Army of Poland. This led to the formation of the 25th Self-Propelled Artillery Regiment with 10 ISU-152s and 22 ISU-122s. 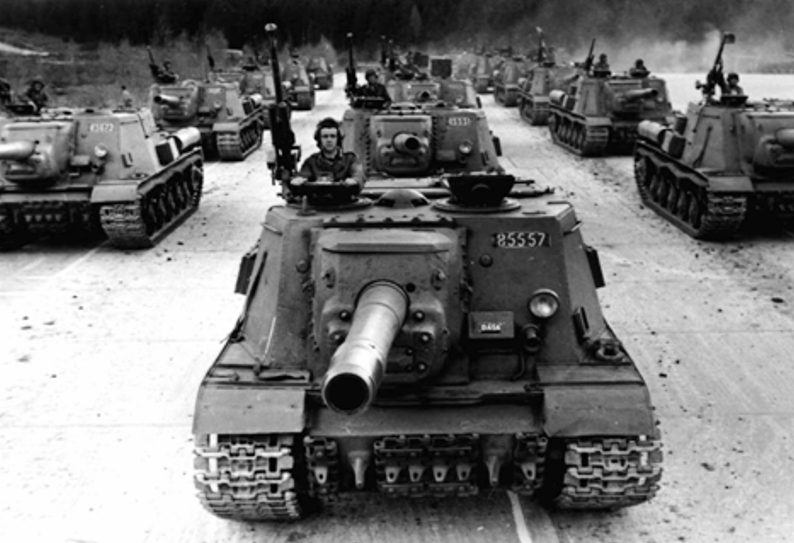 It was fielded with the Polish 1st tank corps (which had T-34/76s, and T-34/85s) and fought in south-west Poland. The later, 13th Self-Propelled Artillery Regiment, with two ISU-152s, took part in the Berlin offensive. They remained in service until 1962. 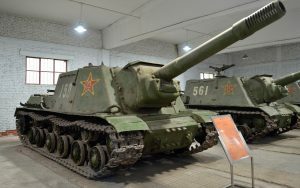 Once the Red Army left Dailan, Liaoning Province, in former Manchuria, all weapons from that area were sold to the People’s Liberation Army, including 67 ISU-152s, which later formed the 1st Mechanical Division. A pair of Chinese ISU-152s at the CPLA tank museum. Some ISU-152s were given after WWII and remained in service until the late 1950s with the Czechoslovakian Army, designated locally TSD-152. A column of Czechoslovakian TSD-152s. Some ISU-152s were given to the 6th, 7th, and 57th Tank Divisions in the 1950s. An unknown number were used during and after the Korean war. They were most likely sold to them by the PRC. An Egyptian ISU-152 during the 1973 war, it is being used as self-propelled artillery, and has been given a desert camouflage. As a result of the growing relationship between the USSR and Egypt in the mid-20th century, Egypt received (or more likely, bought) at least “one regiment” from the USSR in the early 60s, and these ISU-152s (and ISU-122 chassis based BTT-1 recovery vehicles) were used during the 1967 and 1973 Egypt-Israel wars. 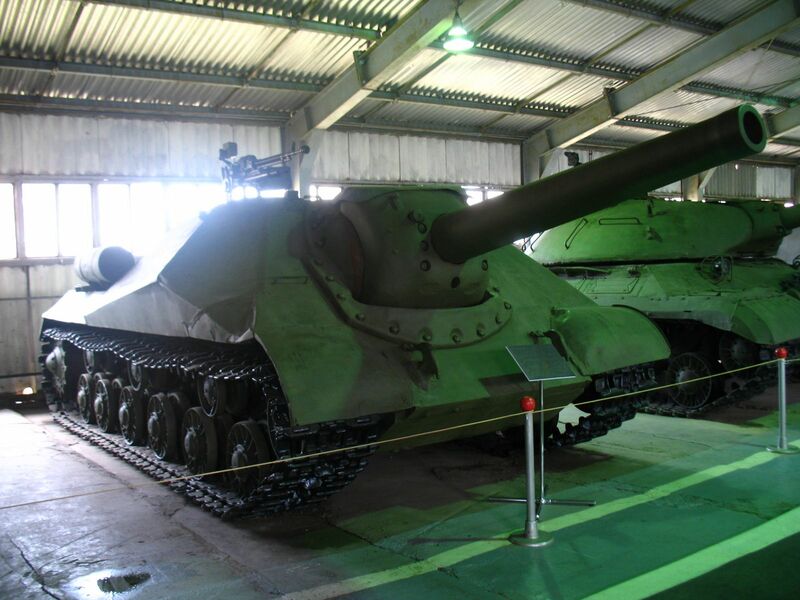 At least one captured ISU-152 stands in Yad la-Shiryon museum, Israel. 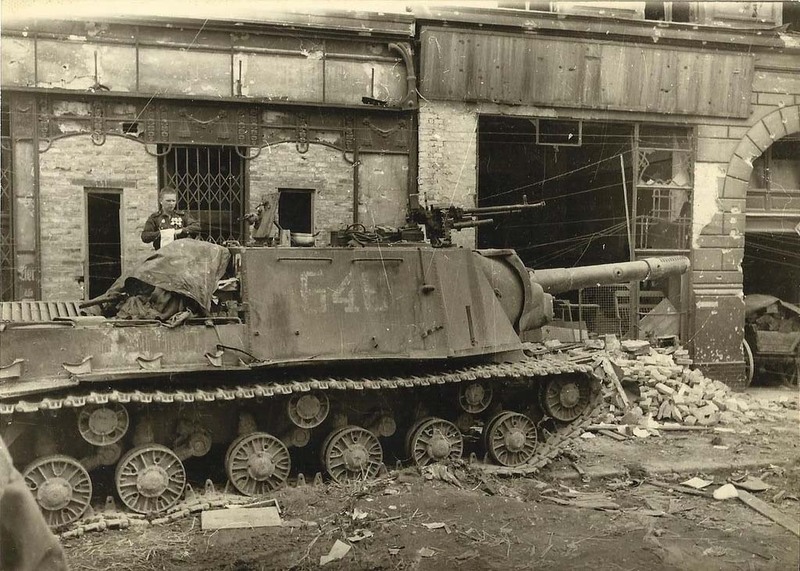 One ISU-152 was abandoned by the Red Army’s 2nd Ukrainian Front because it was stuck in the mud near Pancevo Bridge. In 1946, it was salvaged and was used at the Tank School at Bela Crkva (in modern day Serbia), having fitted it with a T-34’s engine. It was later used as target practice at the Manjaca range. A small number of ISU-152s were used by Iraq during the Iran-Iraq War and First Gulf War. It is unclear how these were obtained, but it is likely that they were sold by the USSR or PRC. They might have been captured during the Iran-Iraq War, but this is speculation only. “Russian Tanks of World War II, Stalin’s Armoured Might“, by Tim Bean and Will Fowler. 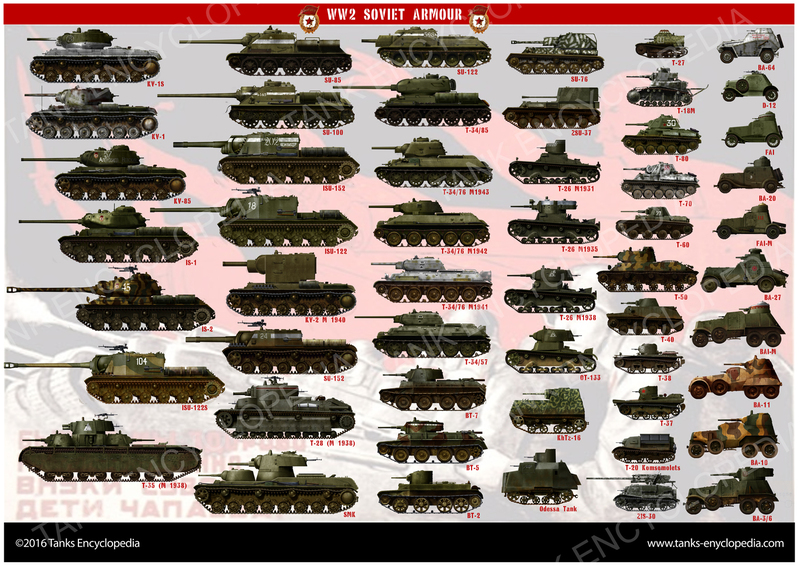 “Soviet Tanks and Combat Vehicles of World War Two” by Steven J. Zaloga and James Grandsen. ISU-152 of the Red Guards, summer 1944, Bagration offensive. Finnish ISU-152. Two were captured in the summer of 1944. ISU-152 of the 7th Independent Guards Heavy Tank Battalion, Berlin 1945. ISU-152 participating in the offensive on Berlin, April 1945. Notice the typical reconnaissance white bands. 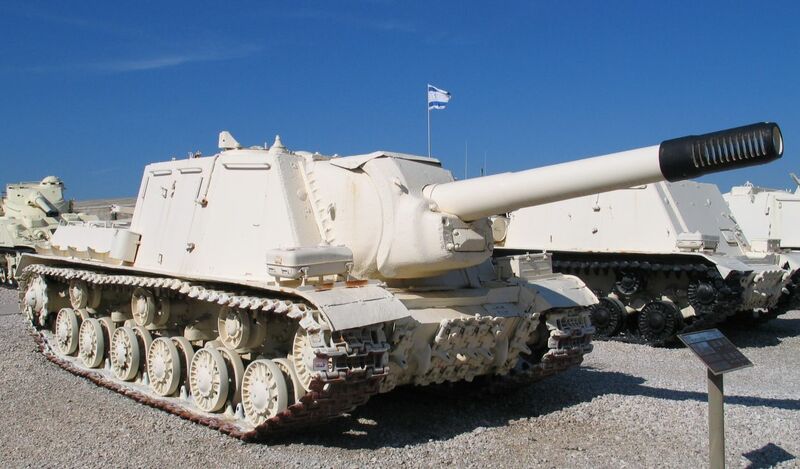 Egyptian ISU-152, war of 1973 (Yom Kippur). Iraqi ISU-152. Several were still in use during the war of 1993, as mobile artillery support. Chinese ISU-152 in the 1950s. This one preserved at the CPLA tank museum. Hello! Great article, as usual, but I do have a question. You make several references to this vehicles use at Chernobyl, and I was hoping you would be able to direct me to more sources on this incident and the use of the ISU-152 in it. Hi guys, great article but I think the caption on the Iraqi ISU-152 need correcting. It currently states “still in use during the war of 1993” but surely this should be either 1991 or 2003? those Romanian ISU-152 were still in use in the mid 80s alongside with SU-76M. Will there be a article for the Object 704? The SMGs and grenades weren’t so much for use if the crew had to abandon the vehicle (although they would be useful then, most likely); they were for short-range defense of the AFV. The machine was vulnerable to close range infantry attacks, particularly those without an AA MG. The SMGs would be used from the hatches and the grenades tossed around the tank to keep enemy soldiers from getting close enough to use satchel charges/grenades/petrol bombs/sticky bombs/magnetic bombs, etc. 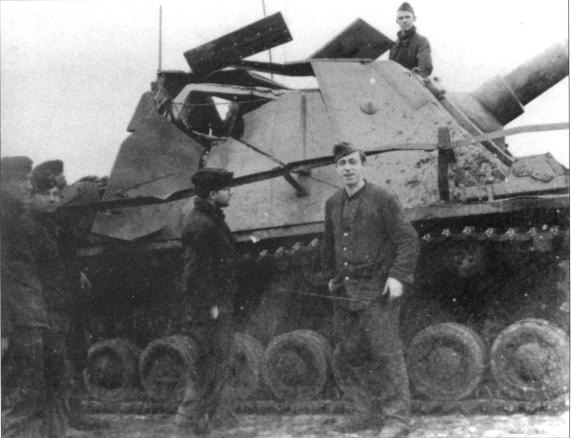 Same reason German AFVs often carried SMGs inside…especially those like the Stugs that lacked MGs. Also, what do you mean “a long muzzle brake was added” to the M-20; the same muzzle brake is visible in all wheeled versions of the gun I’ve ever seen. It is normal equipment for an M-20. So, in order. There weren’t any side hatches to shoot through. They would have had to go halfway out through the hatches to shoot at the enemy infantry, in which case they were already screwed. Also, an AA MG will not be very good for protecting against close enemy infantry due to how vulnerable the gunner is when using it. Maybe at some range. This assault gun should have been accompanied at all times by friendly infantry. If it got to the point were enemy infantry was near it and was in a position to destroy it with satchel charges/etc, something had gone terribly wrong and the tank was not designed to be able to fend for itself in such a situation. Also, the article does not mention a muzzle brake being added.